Most of us think of bullying as something that takes place at the schoolyard. But for many, the activities we associate with childhood bullying-verbal hostility, aggressive manipulation, and psychological violence-occur in the last place we might expect to encounter them: our workplace. Workplace bullying is far more common than most people realize. 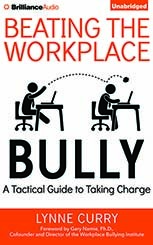 And if you've had it with a bully at work and are ready to make a change, this book will give you the advice and solutions you need. You'll start with learning how not to be a target...and then, this empowering guide-filled with exercises, assessments, real-life examples, and vivid cases illustrating the different aspects of bullying-gives you smart strategies and concrete tools for outmaneuvering anyone, in any kind of work environment, whose behavior torments you and threatens your job satisfaction or livelihood. And at the end of each chapter you'll find questions to help you understand more deeply the bullying dynamic you're experiencing, and the exercises you can use to test your newfound bully-beating skills. Left unchecked, workplace bullying could ruin your job, or even your career! But you don't have to take it anymore. Now you can put a complete stop to unprofessional, nasty behavior. This book shows you exactly how to take back control.